As I waited by the fireplace as I’d done on Christmases before. As a reindeer gently rapping, rapping atop the highest floor. Or perhaps I screamed it like a wild boar. Time to get my gifts galore. And I had just sent several letters saying I’d been good the year before. For I had wished the perfect gift that no one else had wished before. Toys R’ Us had many choices, I could surely not ignore. So, I requested the entire store. By the fireplace until I heard a knock upon the door. That was odd I thought, confused. Why would Santa use the door? Right, I recalled. This thing (fireplace) is fake, and simply set up for décor. In fact, it plugs into the floor. But I wanted my gifts right now! So, I ran to reach the door. And stand and watch as he supplied the many gifts I’d humbly asked before. Here I opened wide the door. I said, as I lay prostrate on the floor. Wasn’t toys from the first world war. I wanted the entire store! Took whate’er that stupid thing was, and dropped some coal onto the floor. Not only had he crushed my dreams, he ruined the whole rhyming scheme! And his cold, judgmental gleam, did cause a rage ne’er known before. Time to even up the score. My adrenaline was churning as I dead-bolted the door. Getting gifts was such a chore. I can’t be pressed to giving better gifts when you want more. Blitzen would be flying: Nevermore. The fearful fat man then complied, emptying contents as he cried. Now old St. Nick was not as smug as he appeared to be before. (Santa) “The North Pole, sadly, all has melted, and my toy shop sank offshore. I am no big fan of Al Gore or of the global warming alarmists out there. 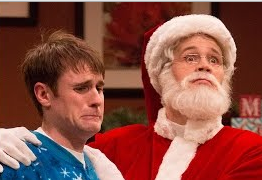 But I do like a good poem now and then; and, I must give proper credit to the funny writers and actors over at the Studio C television show for this hilarious skit. With regard to all of us improving our universe of writing, I offer a holiday thought: 'Reinventing the wheel' is not a prerequisite for becoming a successful author. As I've demonstrated, the fine folks at Studio C simply took a familiar and popular holiday story and merged it with another equally familiar and popular poem and... Ta da! The point is, as we search for ideas and themes to write upon, we might take a step back and see all of the existing writing that we might modify, add to, gussy up, or tone down (copyrights, notwithstanding). For instance, what's the back story behind the dwarves from Snow White? What happened to Belle and the Beast after they were grandparents? You get the idea. Have a wonderful Christmas and New Year! May 2015 become our year to take giant strides forward in our writing and authorship. May the 'Top 10' list be ever in your favor.